Any good journey starts on the right path. At Oak Harvest, the path may start with being referred by a friend or family member, attending a live event or listening to The Retirement Income Show. The next step on the path is a visit with an Oak Harvest Retirement Professional that usually lasts 45-90 minutes. This first visit is where we get to know what’s important to you, your current situation and how we can help. A second visit is scheduled at that time, and your Retirement Professional takes your information back to our headquarters to do analysis with the Planning and Investment Team. At Oak Harvest, everything is done as a team. We work together for you. On your second visit, we analyze your portfolio and discuss strategy to bring your investment plan into alignment with your goals. At this point, you may already know that you want to work with us. If so, we’ll get the new client process started. A client concierge from the Service Team will be assigned to you at this time. Your client concierge’s job is to know your situation and work with your advisor to provide reliable customer service. Occasionally, due to quantity of information and complexity of strategy, it may take another appointment or two to cover your retirement plan or investment portfolio. Upon becoming an Oak Harvest client, our specialists get to work putting your unique investment and income plan together. Given the financial complexity of retirement and everyone’s situation being unique, we often organize the investment and income plan first while providing clients a 12-month implementation plan. This 12-month Oak Harvest implementation plan may consist of estate planning, long-term care planning, legacy planning, tax planning and other retirement goals that you’ve given us. This planning schedule is to lay out how everything that is important to you will be addressed by the Oak Harvest team. 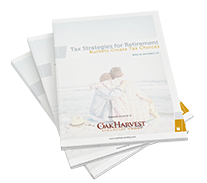 The Oak Harvest Path will generally consist of 4-6 appointments during the first year designed for building, educating, implementing and reviewing your Customized Retirement Plan. Our goal is to cover all the items you've told us are important to you in your first year so you can feel confident and rest easy knowing you have a professionally constructed retirement plan. Upon implementation, you move into the management, monitoring, and review stages. In these stages, we are managing your accounts and scheduling a series of meetings for future years. If your situation changes, our commitment to providing reliable customer service makes us of always available to review and adjust your plan. This is the Oak Harvest Path. Come customize your retirement with us!